Large house with garden and pool near Madrid. 10 minute walk to village centre. - The village centre is a ten minute walk. 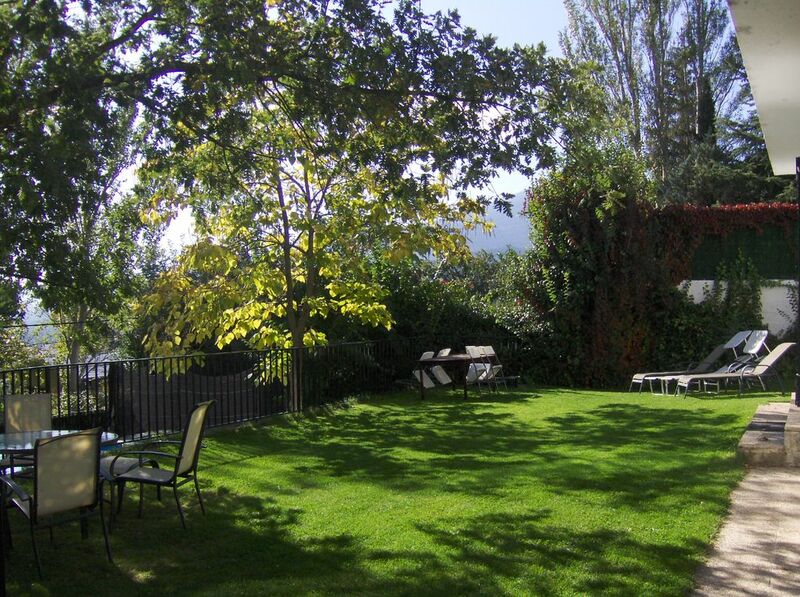 - The house is a 45 minute drive from Madrid city centre and the same from Madrid airport. - 5 double bedrooms. 3 full bathrooms. Spacious kitchen dining area. Sitting room with 42 inch TV. - The house is detached and stands on its own spacious 700 metre garden with a circular 5.5 metre pool in summer and a trampoline. - The dining room can seat 12 people comfortably and large double doors lead straight onto garden. - There are buses every 30 minutes to Madrid. Another option for quick access to Madrid city centre is to drive 15 minutes to Colmenar Viejo and take the train directly into Madrid city centre (Puerta del Sol). - Miraflores can be used as a base for day trips to Segovia, el Escorial, La Granja, Pedraza, Sepulveda, Toledo, Aranjuez or Chinchon. Warner Brothers theme park is a one and a half hour drive. The ski resorts Valdesqui and Navacerrada are 45 minutes away by car. Salamanca, Avila and Cuenca are two hours away. - From the south facing upstairs balcony there are views of up to 80 kilometres to the south and east. To the west and north is the Guadarama mountain range and La Pedriza national park. - The village centre at 1150 metres is an easy 10 minute walk along quiet streets.. As it is 600 metres higher than the city of Madrid, this can be seen in the distance and the lights at night provide a wonderful spectacle. Madrileños use it as an escape from the summer heat. - Leading out of the village is a road which leads to the mountain passes of Canencia at 1500 metres and Morcuera at 1800 metres. Depending on the year's snowfall, Morcuera which is 8 kilometres from the village, is used as a base for cross-country skiing. - Pick up and drop off to/from airport to house can be arranged for up to seven people + luggage at a cost of 75 Euros each way. - The village: One of the prettiest in the province of Madrid, the village centre of Miraflores is a ten minute stroll from the house. The village centre is completely pedestrianised and with its many bars and terrazas is an ideal spot to have your pre-lunch/dinner 'aperitivo' while children play safely within view on the plaza. - Madrid: Madrid is a 45 minute drive or an hour by buses which run every 30 minutes. Buses arrive in Plaza Castilla from where the metro can be taken to the Prado, Reina Sofia art gallery, Thyssen museum, Royal Palace, Plaza Mayor, shopping streets of Serrano and Goya and the Retiro (Madrid's version of New York's central park). The metro is one of the most efficient in Europe and runs from 6 a.m. to 2 a.m.
- Trampoline, table tennis table and children's swings in the garden, Also space for 5 a side football and other games. - Parking in Madrid city centre. For those who prefer to drive down into Madrid city centre there is a free car parking space next to metro Goya during Christmas, Easter and summer months. - Space for 4 or 5 cars to park on street in front of house. - Free parking space also available in Madrid city centre, next to metro Goya. Check with owner. 5.5 metre diametre pool in garden. 1.1 metre deep..
- Included in price is the use of underground parking space in Madrid city centre during holiday periods - Christmas, Easter and Summer months (beside Metro Goya). - DVD player in living room and amplifier with cable to connect to laptops, phones or tablets - Outdoor table tennis table and trampoline (13 feet/4 metres diameter) in garden. - Unlimited Internet wireless broadband in all parts of house. A huge and gorgeous house with great views in a very beautiful mountain town. only 40 minute drive to Madrid center and 20 minutes to a gorgeous New Castle of Manzanares el Real. Owner is fast to respond and a good host. House is on a steep mountain slope with a small road with two way traffic but still could park a big van right across without a problem. The property had everything, it's in a beautiful area and the owner was very nice! We spent a very quiet and relaxing week. We stayed in the house for three nights with 10 personens (7 adults, 3 children). Very cosy and good. We didn't miss anything. Close to the villlage within 15 minutes walking. And a good place to make some nice trips to Madrid, Segovia, etc. Wij verleven er 3 nachten met 7 volwassen en 3 kinderen. Goed en gezellig, we misten niets. Dicht bij het centrum, 15 minuten lopen. En een goede plek om mooie uitstapjes naar Madrid, Segovia, etc. te maken. Wij verbleven er 3 nachten met 7 volwassen en 3 kinderen. Goed en gezellig, we misten niets. Dicht bij het centrum, 15 minuten lopen. En een goede plek om mooie uitstapjes naar Madrid, Segovia, etc. te maken. This was our first time visiting this part of Spain. We had a very enjoyable stay and loved the area. Our 3 teenage boys were with us and they loved the table tennis table and swimming pool and the lovely outside area with plenty of room for kicking a ball around outside. The house was perfect - spacious and plenty of light. It was well equipped and the spacious kitchen had everything you needed for cooking at home, we also made great use of the barbecue. The house is within walking distance to shops and restaurants. The owner was very helpful and the house was lovely and clean. Hope to visit again in the future. Miraflores is 49 kms from Madrid city centre which is easily reached by buses every half hour, by train from the nearby town of Comenar Viejo or by car which takes about 25 minutes to the outskirts and metro station and about 45 minutes to the centre where you can visit The Prado, Reina Sofia and Thyssen museums as well as the Retiro, Plaza mayor and old Madrid. It is situated on the south facing slopes of the Guadarama mountain range and therefore gets a lot of direct sunshine. In the summer months its altitude (1200 metres above sea level) makes for very pleasant temperatures and it is used by Madrileños as an escape from the city heat. With its own reservoir and mountain streams water is not a problem and in Spring the colours of the wide range of wild flowers are impressive - hence the name - Miraflores de la Sierra. The towns of Segovia, La Granja, Pedraza, El Escorial, Toledo, Aranjuez, Avila and Salamanca are all within easy reach for day trips. Ski: The ski rsort of Valdesqui is a 45 minute drive from the house. The other ski resort of La Pinilla is an hours drive.